Edward Ruscha: Words Without Thoughts Never to Heaven Go, exh. cat., Lake Worth and New York, 1988, p. 33 (illustrated in color). D. Ehrenfeld, "Who Will Be Left in the Earth's Community?" Orion Nature Quarterly, 1989, p. 4 (illustrated). J.A. Lewis, "Ed Ruscha, Getting Beyond Words: At the Hirshhorn, the Painter Who No Longer Spells Out His Affinity for Conceptual Art," Washington Post, July 2 2000, p. G6 (illustrated in color). J. Wainwright, "Ed Ruscha," Contemporary, 2002, p. 95. New York, Whitney Museum of American Art, Ed Ruscha and Photography, exh. cat., 2004, p. 207 (illustrated in color). New York, Robert Miller Gallery, Ed Ruscha, 1987, pl. 5 (illustrated in color). Chicago, Museum of Contemporary Art, Ed Ruscha: Recent Paintings, January-April 1988, (illustrated on the cover). Washington D.C., Hirshhorn Museum and Sculpture Garden; Chicago, Museum of Contemporary Art; Miami Art Museum; Modern Art Museum of Fort Worth; Oxford, Museum of Modern Art and Kunstmuseum Wolfsburg, Ed Ruscha, September 2000-April 2002, pp. 106 and 107 (illustrated in color). This work will be included in the forthcoming Edward Ruscha Catalogue Raisonné of Paintings, vol. 3, edited by Robert Dean and Erin Wright, no. P1986.10 (illustrated in color). At once indexical and ambiguous, the shadow paintings harp on a vague American cultural nostalgia. 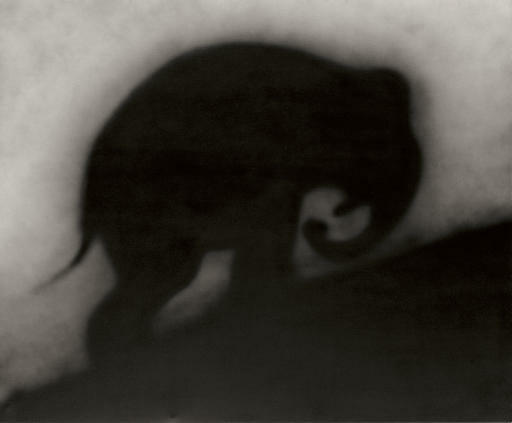 In the same way that Ruscha's word paintings act as textual signifiers for a particular mood, this hulking silhouette of an elephant is a singular expression of the cinematic tragicomic. It is no coincidence that the painting's near twin, entitled Jumbo, (in the MOMA's permanent collection) is phonetically linked to the piteous, Disney character with a set of awkward ears and an incurable case of stage-freight. Burdened by his physicality, he is an outsider under the exacting lights of the big top. While the Disney character does get a happy ending, Ruscha's painting refuses to deliver a Hollywood pipe-dream and remains hauntingly unresolved. Like some films by David Lynch, Untitled has a presence and evokes a distinctly Californian mise-en-scene linked to the darker aspects of Hollywood, a theme which has long fascinated, and continues to engross Ruscha.